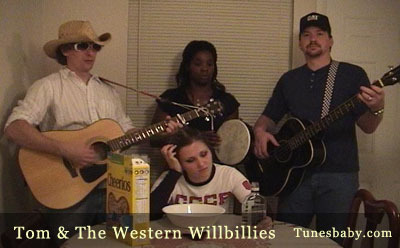 One of the most original and varied bands to emerge from Moore, Oklahoma, Tom and the Western Willbillies is the quintessence anti-folk group. With influences ranging from Ratt and The Doors to Blink 182 and The Beatles, TATWW take musical diversity to the next level. Their style, though vastly unpredictable, transcends boundaries and speaks volumes. Formed after a self-proclaimed 'hard night of excessive peach schnapps and 'Adult Swim'', Tom and the Western Willbillies came from strong creative stock. In the vein of many other musical success stories, TATWW is something of a family affair. Brothers Tom Wilson (guitar/vocals) and Glenn Flansburg (bass/vocals) have been playing together since 1992, and their father and grandfather were both musicians in NW Oklahoma. Tom and Glenn recruited Tom's girlfriend Anitra Peacock (percussion/vocals) in 2003 and Glenn's wife Julia Flansburg (drums) in early 2006.